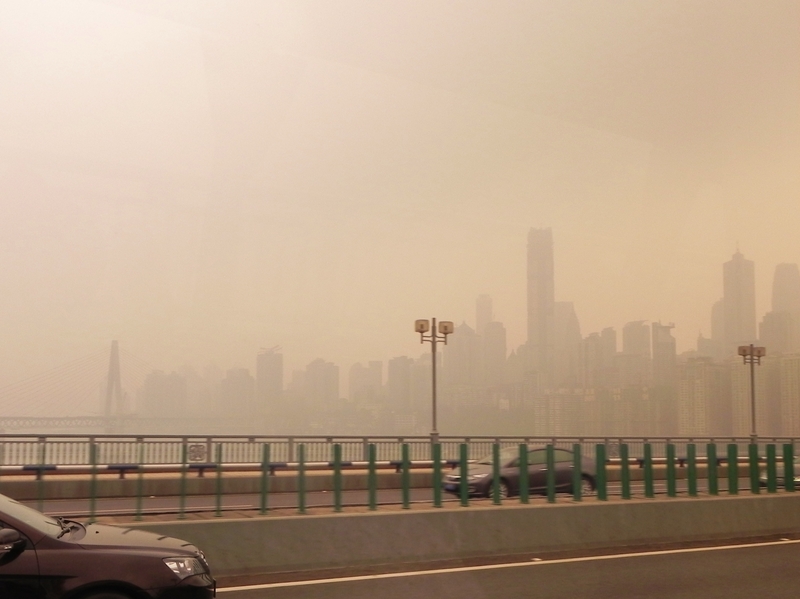 Chongqing has 33m people (8m in city center) and is smoggier than Beijing. Very, very smoggy as a matter of fact. It is the world’s largest metropolitan area, surpassing Tokyo. It is a very new city, with its truly significant history only going back as recently as WWII. Lots of high-rise apartment buildings everywhere. Mostly only 10 years or less old. A very curious mix of a bit of old and mostly new. It’s a very hilly – very few bicycles here – reminds us of San Francisco. 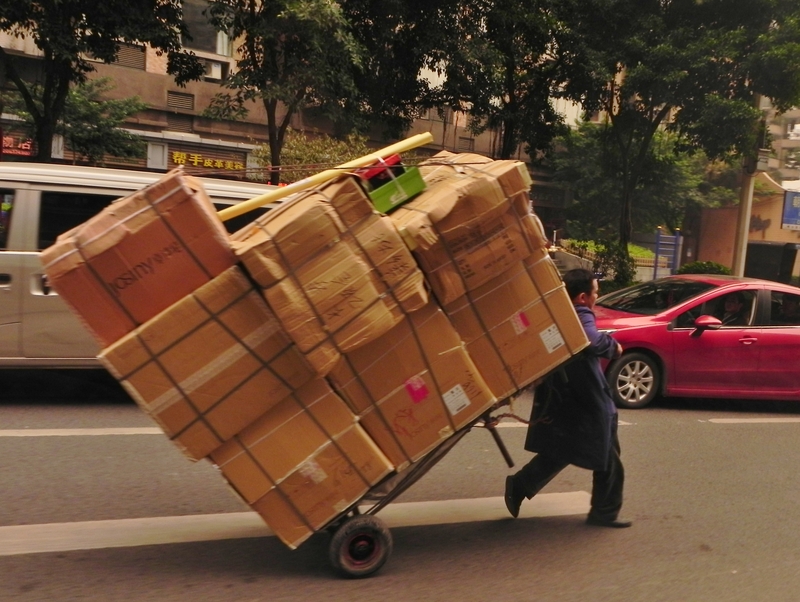 Passed by this fellow on the city streets – can’t imagine how his back feels by the end of the day. 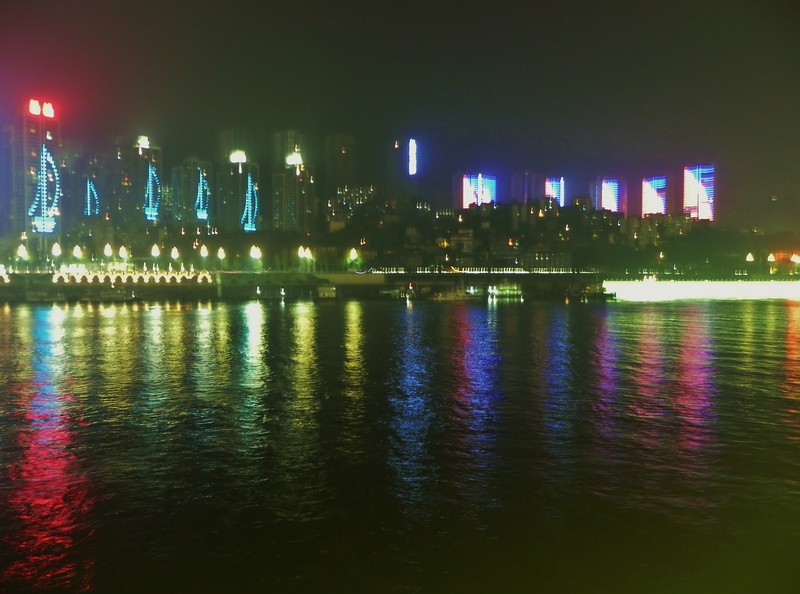 The Yangtze and the Yangtze Dam has had a huge impact on Chongqing. Lots of relocated displaced Yangtze immigrant farmers now work in nearby factories, adding tremendously to the city’s growth, and pollution. Although the Yangtze has only risen about 5 meters (16 ft) in Chongqing since the dam was finished, near the dam the water level rose by 575 feet, and many river villages and farms were flooded. It did control the massive devastating flooding that used to take place on occasion in the lower Yangtze, near Shanghai, and it now allows industrial barge travel as far upriver as Chongqing. The port in Chongqing can handle 10,000-ton ocean freighters now. It’s a very busy port. 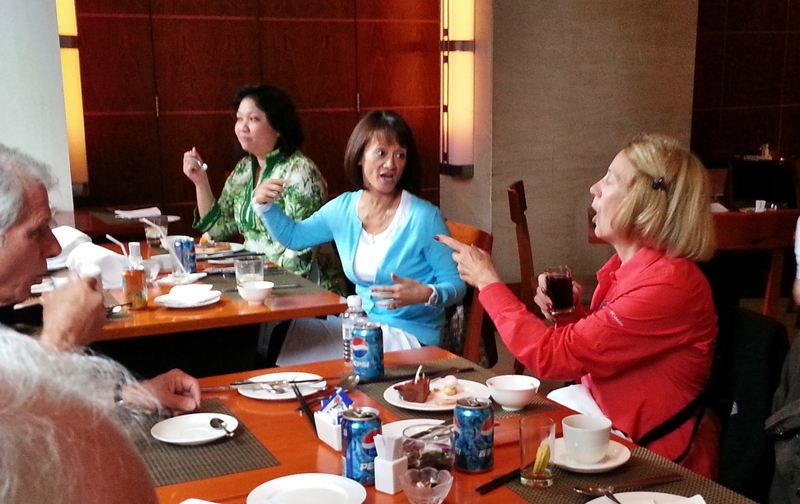 Our first stop was lunch, at the newish 5-star Intercontinental Hotel where we had a superb buffet lunch. We sat next to a table of four US expat ladies who were extremely entertaining and chatty. Pam loved them – they told her where to go shopping in Hong Kong for the best deals. It was a great buffet with lots of very curious choices. Phil had an interesting seafood mix dish that he offered to share – I declined – too many shells, not to mention an overabundance of red hot peppers! A fruit that was a pale magenta with green tipped “leaves” is called Dragon Fruit and was proudly displayed in a case of ice. Very pretty – have no idea what it tastes like. 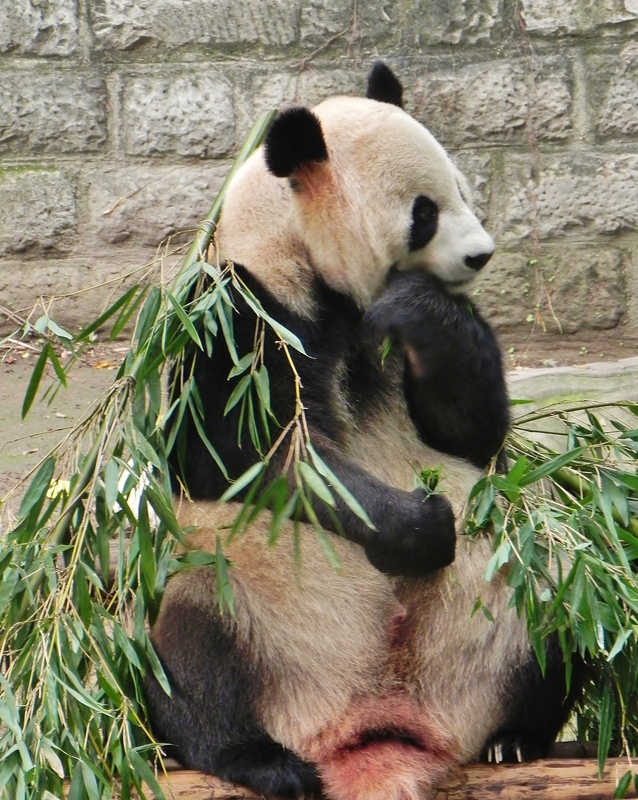 In the afternoon we toured the Chongqing Zoo to view 5 of the 8 pandas eating bamboo – they had just been fed, so we were very lucky to see so many. Plus we saw some red pandas (which look more like red raccoons), hippos, Bengal tigers, and other animals. Got a video of the pandas, and finally figured out how to turn the video off. The 2 hippos were in a teeny-tiny pool – felt sorry for them. They make a sound like very, very loud pigs. Tigers were all sleeping. And of course, we spotted the “king of beasts” together with the tiger, his birth year sign. Merry, our guide, identified the red flowering tree that I’ve been so intrigued with as a “Huai Shu”. We saw one in the zoo. I could get up a little closer to this one and decided that they actually don’t look like flowers so much as little paper lanterns. 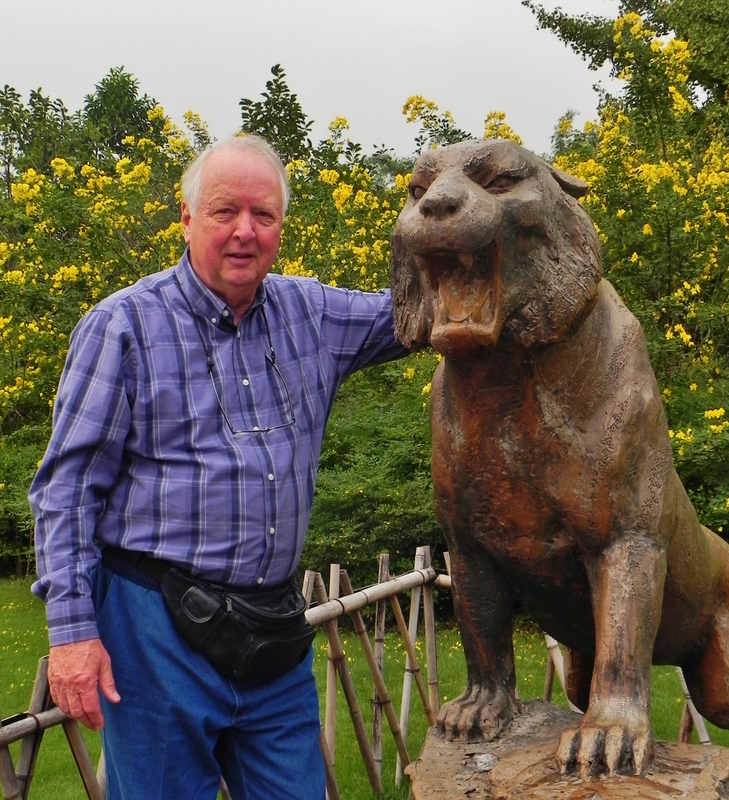 Later, on the Yangtze cruise, one of the guides said it was a Golden Rain Tree or Lantern tree – what appear to be flowers are really fruit and can be cooked or eaten. But not sure I got this right, as perhaps the last guide was not looking at the same thing I was. 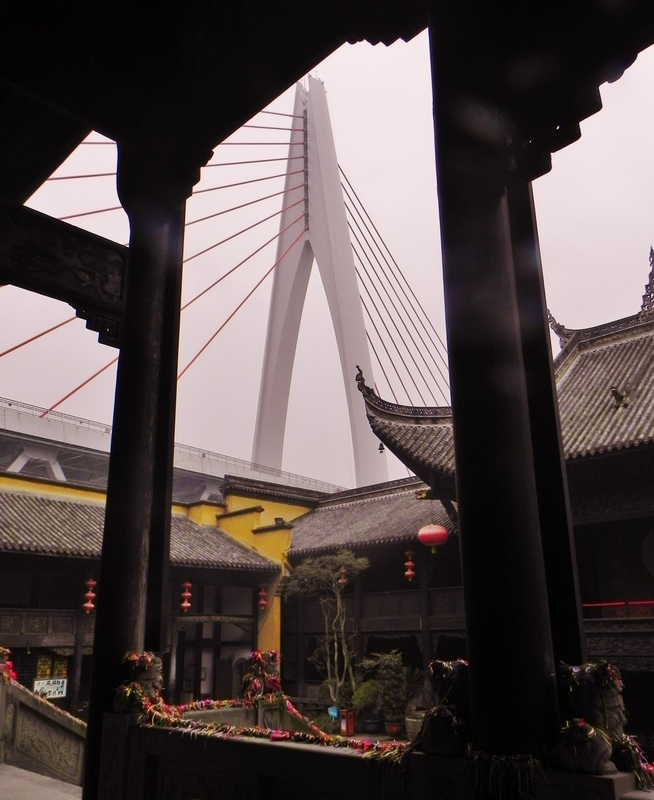 From there we proceeded into Old Town to a 300 year old immigrant built Guild Hall on the Yangtze River. Lots of old furniture and carvings. 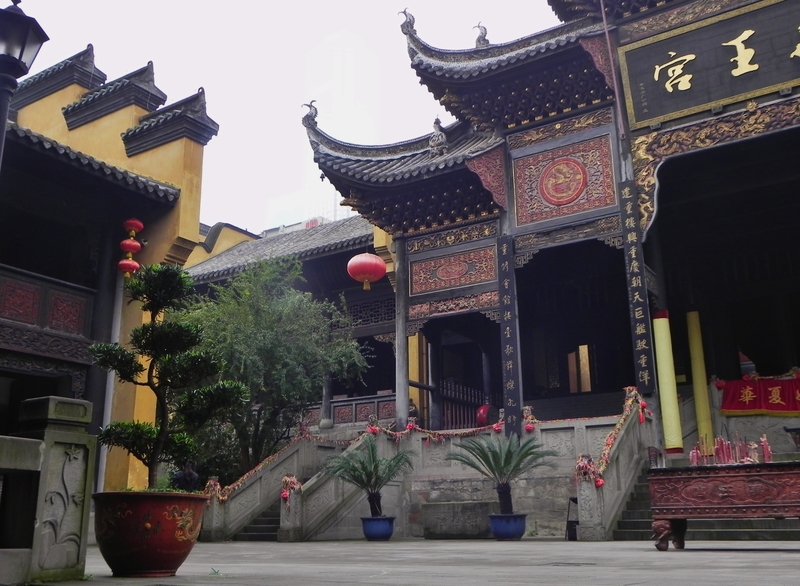 Built in typical curved roof and decorated Chinese style. Statue of the first Emperor in the entrance hall. At one time over 300 people lived here, including the extended family of a wealthy nobleman and their servants. There had a wedding held here this past weekend – hence the red scarves hanging over the balustrade. And of course red as the most auspicious color for weddings. Lovely city dwelling – very peaceful even in this strikingly busy and crowded industrial city. That’s a bridge over the Yangtze in the background. It was getting late by now and we were hungry. 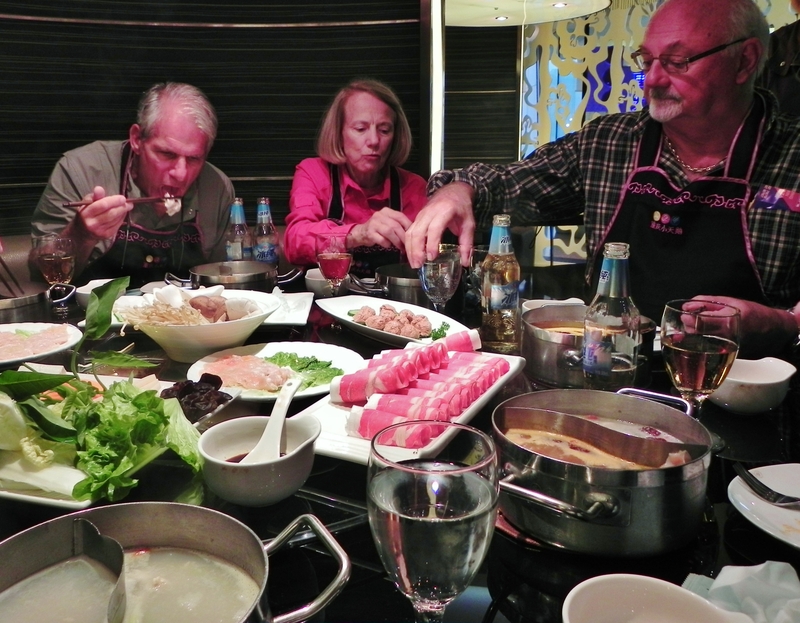 Off we went to dinner in a “hot pot” restaurant called Chongqing Cygnet. This local food is very, very spicy. 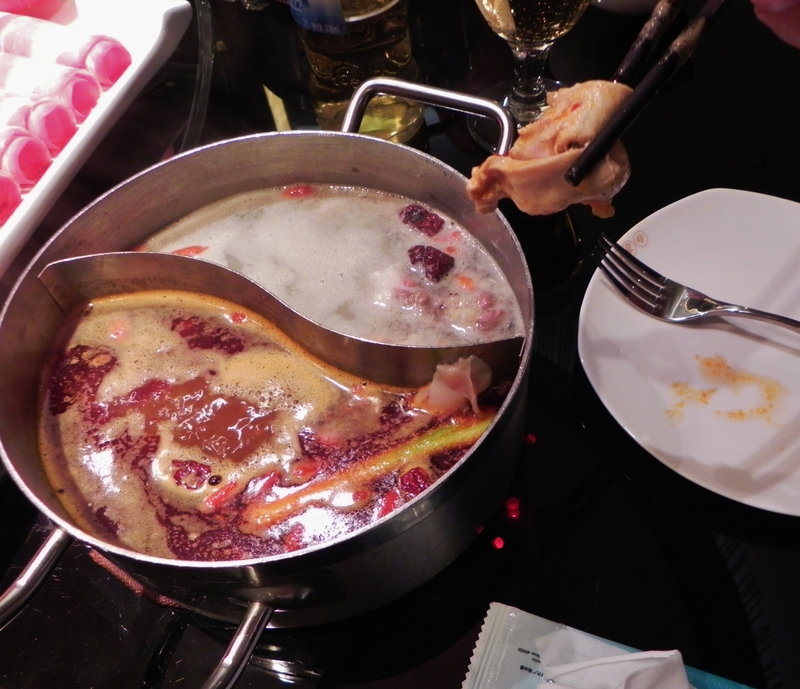 Red chili peppers are cooked with Sichuan peppercorns, which are small green balls and numb the skin or mouth. These form a concentrate that is then added to plain mild broth in your own “hot pot.” We cooked our own raw meat and vegetables in either the mild side or the spicy side of our own “hot pot.” Our “hot pots” sat in front of each of us on the table, with a burner underneath it to keep it hot (see the little red dots on the bottom right of the pan?). The mild side of the pot was actually too mild, so I took one spoonful of DH’s spicy side and added to mine. DH went for the full tilt on one half of his pot and had the waitress put in the whole cupful of the spice concentrate. One of his halves got a little TOO spicy, even for him! We had chicken, pork, meatballs (my favorite in the upper right side of pic), pancakes, and a variety of vegetables. One of these was sliced lotus root, which had the consistency of a turnip but had holes in it. These slices took a long time to cook and even after cooking were still crunchy. A very mild taste. After dinner we boarded the Victoria Anna where we were introduced to Marion, the German Cruise Director, and Jo, our local China Spree caretaker. We were told we would have “special treatment”: eight pieces of laundry per day, free unlimited wine and beer with dinner, and a private guide for the 6 of us. It’s so nice to be “special’!!! 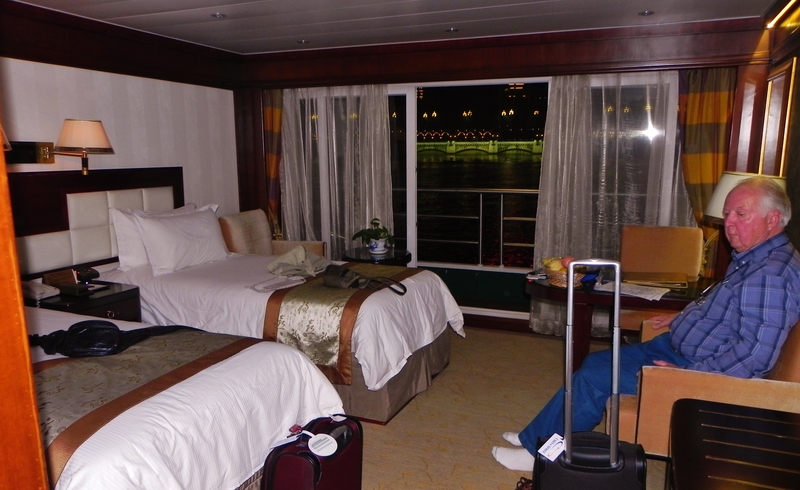 Room 503 on the top floor proved to be one of the largest river shipboard accommodations we’ve enjoyed. The décor is a bit old and tired though. Two beds, but they are standard twins, so my pillows kept falling off. Also, no conditioner – just shampoo and shower gel. The 9:00 pm introductory lecture was accompanied by a couple of 50 yuan Kendall Jackson Cabernet/Merlots. The ship departed during the lecture. Nice way to end the day. From now on wine is free at happy hour and dinner. Very happy, once again, that we signed up for the luxury China Spree tour.